Sometimes referred to as the ‘next Berlin’, ‘Europe’s San Francisco’ or ‘the Chiang Mai of Europe’, Lisbon has built up quite the reputation for digital nomads in recent years. From being voted the Coolest City in Europe 2017 by CNN to being recognised by Dutch freelancing platform Hoofdkraan as the Best City in the World To Be a Freelancer, it’s not hard to see why Lisbon has quickly become a mecca for remote workers. If it’s on your radar as a potential destination, this guide gives you the lowdown on why it’s worth a place on your itinerary, along with practical advice on where to live and work in the Portuguese capital. 1. What’s so great about Lisbon for digital nomads? There are so many reasons why Lisbon – known as Lisboa in Portuguese – has become a haven for digital nomads, but let’s start with the weather. You can’t argue with 300 days of sunshine and mild winters that rarely dip below 10 degrees Celsius, and living a short hop from the beach, there’s plenty of scope for enjoying it. Into your surfing? You’re close to Ericeira and Carcavelos, home to Rip Curl Pro, and only an hour and a half from Nazarè, famous for having some of the world’s mightiest waves. So far, so good. But what’s Lisbon like to live in? For starters, it’s safe, and more affordable than many European cities: think €0.55 for an espresso, €1 for a beer and as little as €7 for a three-course meal in a traditional Portuguese tasca (a casual, family-run eatery). The food and wine is great, and you’ll quickly become hooked on pasteis de nata – Portugal’s famous custard tarts, which hail from Lisbon. Areas of the city such as Cais do Sodré and Bairro Alto are teeming with bars and clubs for nights out, and you’ll find plenty of other digital nomads to enjoy them with; an active Meetup group makes it easy to meet like-minded people in Lisbon. The public transport around Lisbon is comprehensive and cheap, too, so it won’t cost much to travel across the city to see new friends. When you arrive in Portugal it’s just €1.50 from the airport into the city centre by Metro, and once you’re there you’ll find journeys cost between €1.25 and €2 on the Metro or tram (there’s a transport card you can pick up for a discount off each journey – well worth doing if you’re going to be using public transport a lot). Work-wise, there’s a thriving tech and startup scene – even Google has a presence here – and WebSummit is held here each November, bringing techy types from all corners of the globe. Hand in hand with that, there are plenty of places to work, with great wifi download speeds and numerous charming cafes you can work from. Even better, the locals are friendly and English is widely spoken, so communication shouldn’t present too much of a problem while you’re still getting your head around your Portuguese phrasebook. Of course, Lisbon is also a popular tourist destination, which means there’s lots to explore on your days off. You’ll have the UNESCO World Heritage Sites of Belém Tower and Jerónimos Monastery on your doorstep, along with lots of other famous monuments and attractions. What’s more, Lisbon is midway between Porto in the north and the Algarve in the south – perfect for weekend escapes – and the country’s excellent rail network makes it cheap and easy to explore further into Portugal. Accommodation for digital nomads in Lisbon – a Facebook group where you can find places to live in Lisbon, or put up your own post saying what you’re looking for. Lisbon apartments for rent – another Facebook group geared towards those looking for shorter-term accommodation in Lisbon. Casas e apartamentos para arrendar em Lisboa – a Facebook group that’s popular with students, and a good place to look if you’re after a room in a shared apartment. Outsite Lisbon – a co-living space for digital nomads in Cais do Sodré, with prices starting at $347 a week. There are 25 rooms, with a kitchen shared between each five rooms, and there’s even a co-working space on the ground floor. Home Lisbon Hotel – this nomad-friendly hostel has a great location close to Baixa/Chiado and has a co-working space guests can use free of charge. Oasis Hostel – a low-budget but well-located backpackers’ hostel that has private rooms as well as dorms. Digital Bird – with locations in Lisbon, Porto and Coimbra, “DigitalBird is a program that offers you accommodation, a cowork space and true local insights” for just €35 a night. The Best Coworking Spaces in Lisbon – a handy guide with pricing and the lowdown on a number of coworking spaces around the city. 25 cool and value for money cowork spaces in Lisbon – another great list with even more affordable coworking spaces in Lisbon. Cowork Lisboa – located at LX Factory, you can pay by the day, week or month or sign up to the Nomad plan. You can even trial it free for two hours to see what you think. Cowork Central – located in Cais do Sodré and Principe Real, this space has a range of flexible payment plans and markets itself as “The hub for creative, independent minds”. Second Home – describes itself as “a stunning light-filled workspace and cultural venue for entrepreneurs, innovators and social impact organisations”, with a variety of payment packages that bring benefits such as cultural programmes and wellness activities as well as work space. If you prefer to work in cafes, Lisbon’s famous cafe culture means you’re spoilt for choice. Grab a coffee and pasteis de nata and settle down to work in one of the city’s numerous nomad-friendly haunts. Check out the Digital Nomad Cafe Guide to Lisbon by Indefinite Adventure for a great guide to some of the best cafes for working in; Dear Breakfast is one of our favourites — an Instagram-friendly choice with plenty of sockets for charging your devices while you work. Arriving in a new city where you don’t know anyone can be a lonely experience, but the thriving digital nomad network in Lisbon means it’s easy to get stuck straight into connecting with fellow remote workers. Get involved in the digital nomad community by bookmarking these links to keep up with what’s going on. Lisbon Digital Nomads – with 5,800 members, this Facebook group is a great place to meet fellow digital nomads in Lisbon. Lisbon Digital Nomads Meetup – a Meetup group with around 3,800 members where you’ll find events aimed at digital nomads, from weekly socials to talks on how to prevent anxiety (see their website here). DNX Festival – a festival for digital nomads and entrepreneurs, held in Lisbon in September. TL;DR: Which type of Digital Nomad is Lisbon for? 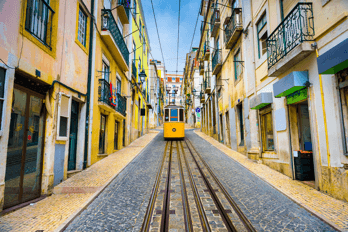 If you want to try out the digital nomad lifestyle, but you aren’t quite ready to jet off to a far-flung corner of southeast Asia, Lisbon is a great place to start. That said, long-term nomads and newbies alike will find lots to love about living and working in Lisbon. It’s well-connected with the rest of Europe and in a time zone that’s convenient for doing business with the US, and with its thriving digital nomad and startup scene, great weather, heaps of culture and affordable cost of living, it’s a great choice whether it’s your first destination or your tenth. If you’re only just starting out on your digital nomad journey, you’ll find lots more handy tips and advice in our How To’s as well as places to live (aka, city) guides.